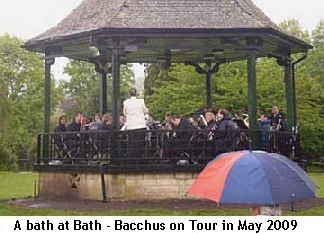 Home Bacchus Wind Orchestra is based in Tonbridge and originally started in 1988 under the auspices of Kent Music. We became independent in 2006 and from September 2017 we will aim to meet most weeks during term time (see the rehearsals page ) at Judd School in Tonbridge. Our aims are to provide local players with the opportunity to explore the large and diverse range of serious music written or arranged for wind orchestra, and to give our audiences a chance to hear this music. We regularly perform concerts in Kent and Sussex, both in formal indoor settings and in bandstands, and we have also undertaken tours, both in the UK and in France. As an independent orchestra, our aims extend to raising funds for local and national charities, and local community groups. Past concerts have supported Hospice in the Weald, WWF and The Bridge Trust. Several of our current members have been with the orchestra since it started. However, as our reputation has grown, so has our membership and we now boast approximately 40 players. Our age range is roughly 16 to 60-something. Our general standard is Grade 8+, but we want to encourage and develop players so there is no "formal" level of achievement. We play music for enjoyment and, although the music comes first, the social aspect of the orchestra is pretty important too. We are managed by a small committee, which is elected by members, so every player has a say in what we do. You can find some more info (the "bumph") about us here.